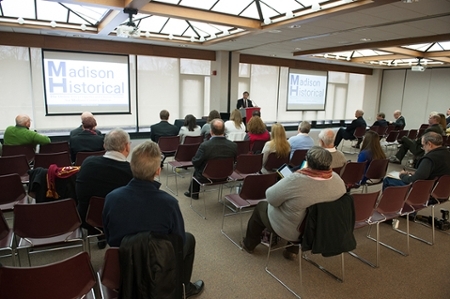 Southern Illinois University Edwardsville hosted a launch event for Madison Historical: The Online Encyclopedia and Digital Archive for Madison County, Ill. on Tuesday, March 14. The innovative digital repository features the rich history of Madison County and invites the public to be content producers. Madison Historical is being developed and managed by SIUE College of Arts and Sciences’ (CAS) Department of Historical Studies associate professors Jeffrey Manuel, PhD, and Jason Stacy, PhD, Stephen Hansen, PhD, faculty emeritus and former interim chancellor, along with undergraduate and graduate students, and an alumnus. 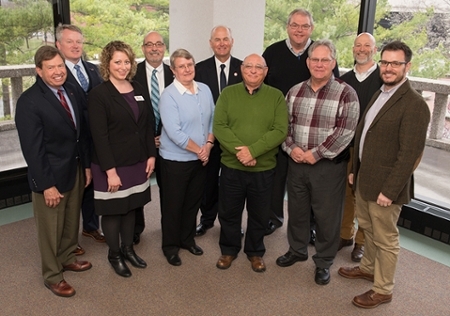 During the event, SIUE Chancellor Randy Pembrook emphasized his support of the project, which aligns directly with the University’s commitment to high impact community engagement practices (HICEPs). CAS Dean Greg Budzban, PhD, led the event that offered an introduction to the innovative project and an opportunity to interact with the digital materials. Budzban emphasized that Madison Historical places SIUE at the national forefront with the potential to serve as a template for communities around the country. “This project aims to preserve the critical local history of the people, places and events that created the very fabric of our lives,” said Buzban. “Madison Historical embodies a new type of scholarship, the digital humanities, which is a welding of technology and the traditional humanities, in a way that is extremely exciting. The Madison Historical team offered attendees a visual tour and lesson on the site’s functions, emphasizing its interactive and complimentary nature with partner historical institutions throughout the county. “Madison County’s fascinating history is deeply representative of a lot of the major changes that have occurred in Illinois and nationwide in the 20th century,” Manuel said. Madison Historical also strives to become an effective educational tool for K-12 teachers that provides opportunities for students to get involved and excited about research. For more information on how to contribute ideas or materials, or become a content producer, email the team at madisonhistorical1812@gmail.com. Photo: SIUE Chancellor Randy Pembrook shares his excitement and support of Madison Historical during the innovative digital archive’s launch event. (L-R) Dr. Stephen Hansen, John Simmons, chairman of Simmons Hanley Conroy Law Firm, Megan Allen with Phillips 66, CAS Dean Dr. Greg Budzban, Mary Westerhold with the Madison County Historical Society, Madison County Regional Superintendent of Schools Dr. Robert Daiber, Madison County Board Member Nick Petrillo, Superintendent of East Alton-Wood River District 14 Dr. John Pearson, Granite City Mayor Ed Hagnauer, Dr. Jason Stacy, and Dr. Jeffrey Manuel.